Forest Luck Equestrian is privileged to represent several equestrian vacations in Ireland. We are happy to report that we have added additional tours including a luxurious estate where one can improve their show jumping and/or cross country jumping skills, as well as introduction to fox hunting. 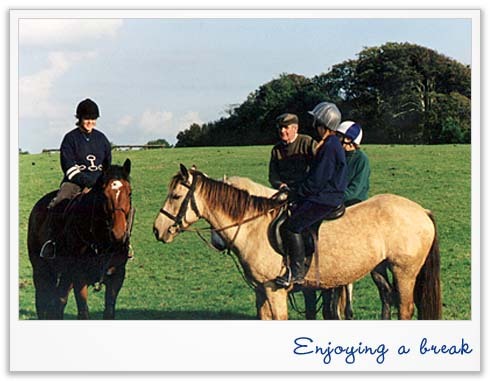 For non-riders there is golf, fishing, hiking, falconry and spas. We also can do a customized residential riding program. Why book through Forest Luck Equestrian? We offer first-hand information about the riding holidays and the locale. Since we are actively involved in many equestrian pursuits here in the U.S. and are lucky to be able to travel regularly to Ireland this allows us to pass our wealth of knowledge on to you. We provide our service at no extra fee or charge. Our prices are the same low prices as those offered in Ireland - the difference is the service we provide: we go the extra step, recommending hotels, restaurants, shopping & that pub that plays traditional Irish music, as well as assist with travel arrangements such as air and ground transportation. We also provide a suggested packing list and activities. And should you have forgotten something, or need that last minute item of riding apparel, we can tell you where the tack shops are. As all things equestrian are our passion, we will be delighted to chat with you about horses, riding, and vacations in Ireland!